With tremendous sadness and regret we announce the passing of Arnold Mycock of Cotuit, Massachusetts affectionately known as, “Mr. Cotuit Kettleer.” He died in his home on April 22, 2016, at age 92 after a brief illness. Arnold Mycock was born in Fall River, Massachusetts on February 5, 1924, the son of Abraham Mycock and Evelyn G. “Lena” Wordell. He grew up on Riverside Avenue in Pottersville, a village neighborhood in the town of Somerset, MA. He was a star athlete at Somerset High School where he graduated in 1942, and was later inducted into the Somerset High School Athletic Hall of Fame in 1993. After high school graduation, Arnold Mycock proudly served his country in the Army Air Corp during World War II. After completing his military service, Arnold attended Brown University in Providence, Rhode Island, and, in 1950, moved to Cotuit, MA. Arnold Mycock joined the Cotuit Kettleers organization in 1950 as a volunteer offering to do, “whatever needed to be done,” a trait which he carried until the day he died some 67 years later. He quickly immersed himself in the Cotuit Kettleers organization with his lifelong love of baseball and desire to volunteer. Arnold’s profession was that of a Title Examiner, however those who knew him well said that he would have been an integral part in the management of any professional baseball organization. Arnold helped form the Cotuit Athletic Association in the early years as the main sponsor of the Cotuit Kettleers and the fledging team quickly became a fabric of the community. Whether it was fundraising, bookkeeping, assessing a ballplayer’s talent, building a new fence, recording hitting & fielding statistics, or cutting the grass at Lowell Park, Arnold did it all. Arnold would become the General Manager of the Kettleers later in 1950, and he continued in that position until 1994, an incredible run of 44 years. As General Manager, Arnold Mycock guided the Cotuit Kettleers to over 770 wins and 12 Cape Cod Baseball League Championships. During that span, Arnold nurtured the baseball careers of more than 40 players who went on to play in Major League Baseball. He worked tirelessly with his dear friends Art Brennen and Mo Sherman, affectionately known as the “Three Amigos,” to oversee, guide and improve the Kettleers organization. 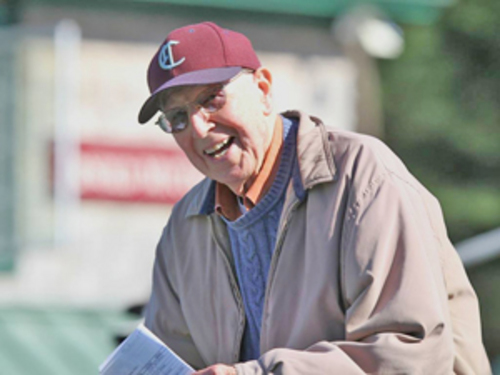 In addition to his unparalleled service to the Cotuit Kettleers, Arnold Mycock was a driving force in the very creation of what is known today as the modern Cape Cod Baseball League. He was instrumental in combining two separate baseball leagues on Cape Cod into a single league, forming its non-profit incorporation in 1963, and gaining NCAA-sanctioned status for the newly organized Cape Cod Baseball League. Combined, these efforts created the modern Cape Cod Baseball League that is widely recognized as the best summer collegiate baseball league in the Nation. Thereafter, Arnold Mycock served in numerous League roles, which included, Vice President, Treasurer, League statistician, and scheduler. In 2012, the American Baseball Coaches Association (ABCA) presented Arnold Mycock with their prestigious Meritorious Service Award at the ABCA Convention in Anaheim, CA. The Meritorious Service Award is presented annually to a person who has proven himself/herself in service to amateur baseball and the ABCA, and whose actions and involvement have resulted in a notable impact on the sport. A humble man who avoided the spotlight, Arnold was a genuine baseball fan through and through. He loved the game of baseball, and he loved the Cotuit Kettleers. Arnold had many friends and admirers in Cotuit and around this great country, and he was truly one of the finest gentlemen you would ever meet.